The way businesses sell their products has changed due to the rapid advancement of technology. As one of the most important invention, Internet plays a major role in changing consumer shopping behaviour. Online marketing became a thing as soon as the first browser was launched to the public in early 1990s. However, online transaction then was very sketchy and risky that many people chose to avoid it. But you can now look for virtually anything from the palm of your hand safely, thanks to the rapid advancement of technologies and secure payment gateways. Online payment security isn’t really a problem for businesses right now. The real challenge is conversion. Optimizing your company’s conversion rate requires you to put extra effort in to building a solid conversion funnel. But first, you need to catch the attention of the right people who are likely to be interested in your product.. There are many ways to stand out on the Internet: blog posts, advertising, infographics, and explainer videos. Among those things, explainer videos are arguably the most popular among startups and companies as their go-to content for their online marketing. It began when DropBox proved it possible to sell a product that was (then) very niche, innovative, and unfamiliar to the public by using an explainer video. Explainer videos are short animations that can effectively explain the concept of a product, how it works, and the advantages that it offers. Most explainer videos that you can find online are animated, and there is a reason why. Animation is easier to customize, manipulate, and modify the visual elements of animated videos such as colors and illustration, which are the keys to make a content stand out. This flexibility also makes it easier to present a situation that is relatable to viewers, which would require enormous effort in live-action videos. Beside the eye-catching visuals, there is something more crucial for an explainer video: script.A great explainer video script should be an engaging product introduction, description, and call-to-action written in a conversational tone. There are three elements that you need in an explainer video script: hook, body, and call to action (CTA). A direct “greeting” to your target customer. The problems that they have (which your product can solve). The challenges they face in trying to solve their problems. Why it’s different from other products (if any). Knowing the component of an explainer video is one thing, but being able to write an engaging explainer video script is another. For that, you need the basics of copywriting, psychology of words, and most importantly a lot of practice. Explainer videos are a part of a marketing funnel. It plays a significant role in engaging potential customers to find out more about your product and by extension, your company. However, there are best practices that you can implement throughout the process to achieve a better result. According to research by Breadnbeyond, the average word count for a 60-second explainer video is 140-150 words (in English). Audience retention is crucial for an explainer video. The lack of audience retention will cause an explainer video to be obsolete because viewers won’t see the final CTA. An experiment on explainer video duration shows that the optimal length for an explainer video is between 1-2 minutes with 57% audience retention rate. It requires a lot of practice to develop the skill to engage viewers with a video. You need to understand how your target market react to things they see online and leverage that information to your benefit. In order to do that, you need to understand at least the basics of copywriting and psychology of words — then apply them to your explainer video script to trigger the best possible reaction from your online target market. 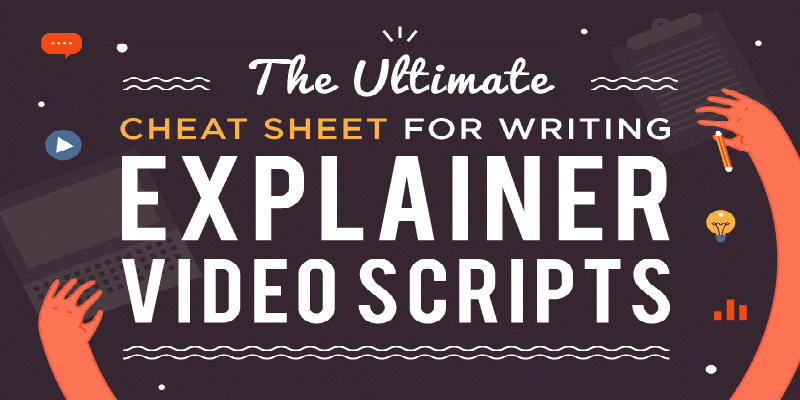 Breadnbeyond, an explainer video company, created an infographic called “The Ultimate Cheat Sheet for Explainer Video Script”. This infographic will teach you how to create an engaging script, get a grasp of psychology behind an engaging script, and how to write a copy. Andre Oentoro is the founder of Breadnbeyond, an award-winning explainer video company. He helps business increase conversion rates, close more sales and get positive ROI from explainer videos (in that order).